ST. PETERSBURG, Russia, July 2, 2012 (ENS) – The heart of the Congo Basin rainforest where elephants, gorillas and chimpanzees still survive was named a World Heritage Site Sunday by the United Nations Education, Science, and Cultural Organization, UNESCO. The first World Heritage site that spans three nations, the Sangha Tri-National Protected Area complex covers 10,000 square miles (25,000 km2) stretching across the Republic of Congo (Brazzaville), Cameroon, and the Central African Republic. At its annual meeting in St. Petersburg, the UN World Heritage Committee declared the site would be added to its list along with five other natural sites of outstanding universal value. The World Heritage Site declaration marks the culmination of a vision dating from 2000 when the three countries agreed to work together to assure conservation and sustainable use of natural resources of the area. The core of the Sangha Tri-National Protected Area is formed by three adjoining national parks connected by the Sangha River. “Sangha Trinational is not a fragment but part of a much larger intact environment with good conservation prospects, and harboring critically endangered species,” said Tim Badman, director of the World Heritage Programme of the International Union for the Conservation of Nature. In its role as official advisor to the committee on natural sites, the IUCN recommended designation of the Sangha Tri-National Protected Area, usually called by its French acronym, TNS. The TNS already benefits from long-term technical and financial support from the Wildlife Conservation Society, World Wildlife Fund, a UK-registered trust fund called the TNS Foundation, UNESCO’s World Heritage Centre, the UN Great Apes Survival Partnership, GRASP, and the governments of the United States, Germany, France and Spain, as well as private donors. While listing as a World Heritage site does not completely protect areas of Outstanding Universal Value from resource extraction, the committee is in the process of developing a set of formal guidelines for countries that are Parties to the World Heritage treaty to keep extractive industries out of World Heritage sites. “This World Heritage status will introduce the TNS to the rest of the world and lead to increased support for the continued protection of the area’s globally important biodiversity and for the people that depend on it,” Conrad said. 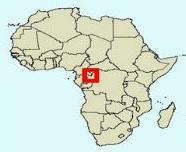 The TNS has one of the lowest human footprints in equatorial Africa. 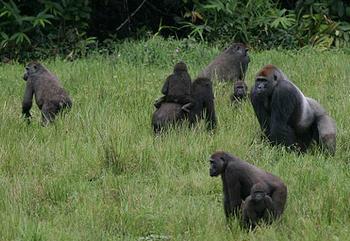 Its tropical forests, wetlands, and natural forest clearings known as “bais” attract multiple gorilla groups simultaneously, while others host thousands of parrots. The bais are exceptional hubs for social and genetic exchanges for wildlife. 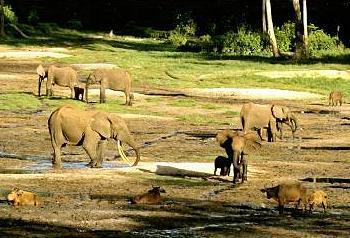 Only there do more than 100 forest elephants so often congregate, sometimes with other large mammals such as forest buffalo, giant forest hogs, striped antelope known as bongo and swamp-dwelling antelope called sitatunga. The new World Heritage Site is made up of a core 2,911 square miles (7,542 km2) area consisting of Dzanga-Ndoki National Park in Central African Republic, Lobéké National Park in Cameroon, and Nouabalé-Ndoki National Park in the Republic of Congo. An additional 6,903 square miles (17,880 km2) buffer zone is managed for selective logging operations, many of which are certified by the Forest Stewardship Council as logged sustainably. 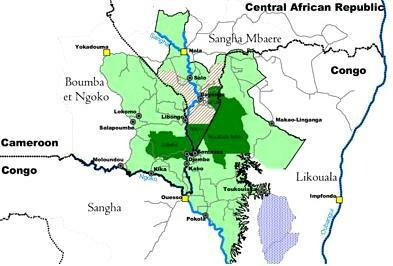 The buffer zones include the Dzanga-Sangha Dense Forest Special Reserve in Central African Republic, a multiple use area where agriculture, hunting, logging and safari hunting are permitted. There are five logging concessions bordering the Nouabalé-Ndoki National Park and a series of logging and community-use zones in Cameroon. The World Heritage List includes 957 properties forming part of the cultural and natural heritage which the World Heritage Committee considers to have outstanding universal value. These include 739 cultural sites, 189 natural sites and 29 mixed cultural-natural properties in 155 countries. 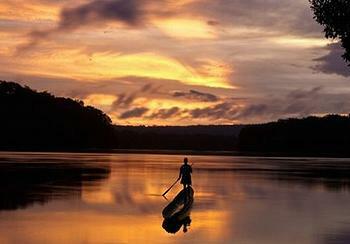 As of March 2012, 189 of the world’s 193 governments had ratified the World Heritage Convention.